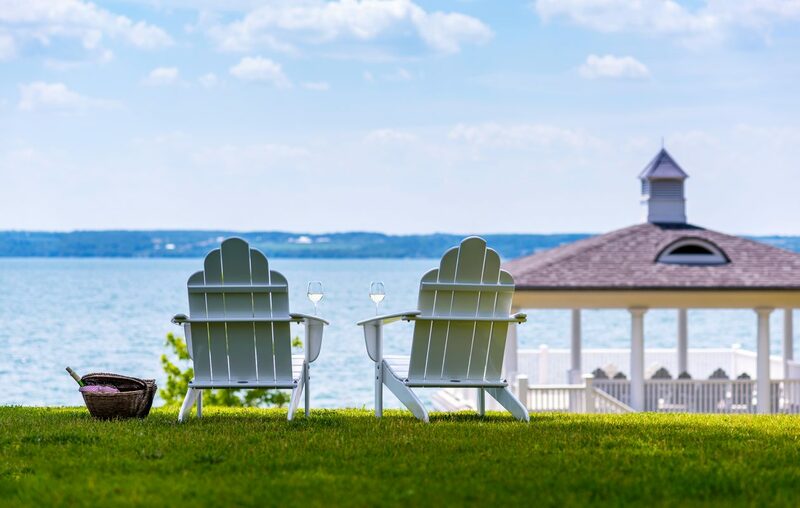 Inns of Aurora offers four properties perfect for a mini-moon, nestled on the shore of Cayuga lake. Hotels abound. Honeymoon hotels do not. Even if you’re staying close to home, you want something intimate, romantic…and special. A place where you don’t necessarily feel compelled to leave. After all the hubbub and stress leading up to the wedding, isn’t that what honeymooning should be about? Here are a few places to find solace for two, listed within proximity to Buffalo. This hidden gem isn’t inexpensive—but it is completely unique. A former summer retreat for a Pittsburgh oil baron, the grounds and buildings have been repurposed as a luxury resort. Opt for one of a dozen well-appointed, beautifully situated cabins and experience the utmost in privacy; you’ll only need to leave for meals in the Big House (gourmet, with an incredible wine list) and optional activities, like a lovely hike through the forested grounds; a swim in the pool; or a fly-fishing excursion in one of a few on-site lakes (gear provided). Forget London: For over-the-top Anglo luxury, there is nowhere on (this) continent like the Prince of Wales Hotel in Niagara-on-the-Lake. Elegant rooms are outfitted with beautiful antiques, and there’s fine dining on site at Noble restaurant. The hotel also offers traditional afternoon tea in its Victorian drawing room. And if you do care to venture out, the hotel is located in the center of town, within walking distance to Niagara-on-the-Lake’s eclectic shops, eateries and bars. There’s not a whole lot to do in Aurora, NY. Nestled on the shore of Cayuga lake, it’s primarily home to two things: MacKenzie-Childs ceramics and Wells College. And yet it’s also home to four exquisite inns, any of which would make for a special mini-moon: Aurora Inn, Rowland House, E.B. Morgan House and Wallcourt Hall. All are perfectly appointed, with the Aurora Inn dining room offering fresh, locally sourced sustenance. Fun fact: The inns were founded by Pleasant Rowland, the creator of the American Girl Doll franchise. (Rowland graduated from Wells and came back to help restore the town 25 years later.) She spared no detail in their design and restoration. If you want to feel like you’re mini-mooning inside a Monet painting, this is your spot. Especially if spa treatments are your idea of relaxation. Accommodations include one of four freestanding cottages within the chateau-like inn, located on grounds inspired by a private French wine country estate. Nearby Skaneateles is situated on a lake and has a charm all its own.